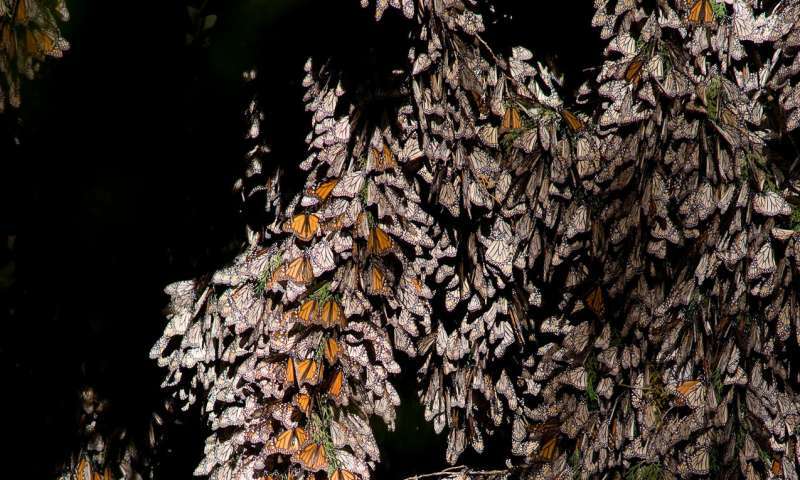 Deforestation in the core zone of the Monarch Butterfly Biosphere Reserve in Mexico decreased by 57.6 per cent, from 15.8 hectares lost during the 2016-2017 period to to 6.7 hectares in 2017 -2018. The survey is carried out every year between February and March by the WWF-Telmex Telcel Foundation Alliance, the National Commission of Natural Protected Areas (CONANP) and the Biology Institute of the National Autonomous University of Mexico. Although forest degradation in general decreased, there was an increase in illegal logging – from 0.6 hectares in 2016-2017 to 1.4 hectares in 2017-2018 – found mainly in the San Felipe de los Alzati community, in Zitácuaro, Michoacán, where a weakening of social cohesion caused the additional clearing. The drought affecting the region for several years impacted 3.9 hectares, almost triple that of the previous period. "Forest degradation decreased because of the absence of large-scale illegal logging; the impacts from the 2016 storms are over, and no new extreme weather events were registered. Since 2009, there has been a significant reduction in illegal logging thanks to the commitment of the communal farmland associations (ejidos) and the indigenous communities; surveillance efforts; and payment for ecosystem services. We cannot lower our guard and we must continue helping the development of the local communities", said Jorge Rickards, WWF Mexico General Director. The Monarch Butterfly Biosphere Reserve protects 56,259 hectares of forest, including 13,551 hectares of core zone that harbors the priority hibernating habitat for the monarch butterfly (Danaus plexippus), which travel more than 4,000 kilometers from Canada and the United States to spend the winter in these forests. The Reserve also hosts 132 bird species, 56 mammal species, 432 plant species, and 211 fungi species. These forests also generate water for the Cutzamala System serving more than 4.1 million people in Mexico City and metropolitan area. Forest cover monitoring is carried out by comparing photographic mosaics of the trees in the previous and current year, incorporating the data into a geographic information system. These results are validated with field work carried out with leaders from the communities and farmland associations. The results of the monitoring are used as the scientific basis for delivering the Monarch Fund's economic incentives to core area landholders as part of a conservation strategy created 15 years ago by WWF and the Mexican Fund for the Conservation of Nature (FMCN), in coordination with the Ministry of Environment and Natural Resources, and the governments of Michoacán and the State of Mexico, to promote long-term forest conservation in the Monarch Reserve. These benefits are in addition to the National Forestry Commission payment for hydrological ecosystem services. The communities also receive support for conservation and sustainable development projects from the National Commission of Protected Natural Areas, through the Reserve management and the WWF-Telmex Telcel Foundation Alliance, as well as the Yves Rocher Foundation and the State of Mexico government. To strengthen sustainable forest management, the WWF-Telmex Telcel Foundation Alliance has planted 13.9 million trees in 12,666 hectares from 2003 to date, using seedlings from 13 community nurseries; established a network of 31 mushroom production modules and 3 infrastructure modules for sustainable wood products; and reactivated and improved a communal aquaculture center. Sustainable tourism has also been developed by the alliance and includes promoting architectural infrastructure, training and equipping 39 forestry brigades and dozens of providers serving an average of 100,000 visitors during the hibernation months. "In 2018 we celebrated 15 years protecting the monarch butterfly and its hibernation forests. Our commitment to this species, its migratory phenomenon, and the communities of the Monarch Reserve is stronger than ever. We will continue working to preserve this natural wonder and contribute to the wellbeing of the local residents", said Marcela Velasco, Telcel Marketing Director. The main threats for the Monarch butterfly in North America are the reduction of its reproductive habitat in the United States due to diminishing supplies of milkweed caused by indiscriminate herbicide use, and land use changes; forest degradation in its Mexican hibernating habitat; as well as extreme weather conditions in Canada, the United States, and Mexico.